11/1/2009 - At approximately 11:15 PM Kyrstin's Jeep Grand Cherokee entered a small "stock pond" nine miles northwest of Dickinson, ND. A few minutes later, Kyrstin, along with Ashley Neufeld and Afton Williamson would drown in the frigid pond waters. It would take 40 hours before they would be discovered and we would know what happened. Referred to locally as "The Dickinson Three", or "D3" for short, Afton, Kyrstin, and Ashley became the focus of a multicounty search. During that 40 hours, law enforcement, search and rescue, and friends would intensely search the countryside for clues as to where they might have gone. Thanks to the skills of Arizona C.A.P. officer Justin Ogden, an expert in cellular forensics and triangulation, they were found sooner rather than much later. Unfortunately, not soon enough to save their lives. Afton, Kyrstin, and Ashley (memorialized on t-shirts, bumper stickers, and in the Z-MAN song "Every Time" as "A.K.A.") were all student athletes on the DSU softball team. The #3 NAIA National team in 2009, DSU was looking forward to these players helping achieve a National Championship title in 2010. While they can't take the field in uniform, we all pray that they'll be the 2010 team's "Angels in the Outfield." Prelude - Photos 1 - 3 Wed 11/4/09 - Family and Friends visit the accident site - Photos 4 - 19 Thu 11/5/09 - Post-memorial reception at DSU - Photos 20 - 80 Fri 11/6/09 - Reclaiming items from the Jeep, and spending time with friends at the basketball game. - Photos 81 - 98 Mon 11/9/09 - Ashley Neufeld's Memorial Service - Photos 99 - 115 Tue 11/10/09 - Thur 11/12/09 - Kyrstin's in-home viewing and family visitation - Photos 116 - 127 Fri 11/13/09 - Kyrstin's Public Viewing at El Camino Memorial Park - Photos 128 - 135 Fri 11/13/09 - Afton Williamson's Memorial Service - Photos 136 - 148 Sat 11/14/09 -Kyrstin Gemar's Memorial Service and Burial - Photos 149 - 224 (Photos 153-224 courtesy of Chris Vergara - Photography) Sat 11/14/09 - Post-service reception at Gemar house - Photos 225 - 238 Sun 11/15/09 - Clairemont Girls Fastpitch softball league candlelight memorial for Kyrstin Photos 239 - 261 (Photos 246 - 260 courtesy of Harold Colson) The Aftermath - These are misc photos of items or people that have touched us since the memorials. Fri 2/19/10 - Grossmont College retires Kyrstin "Mama K" Gemar's jersey in this simple ceremony at 3rd base. Sat 3/27/10 - Clairemont Girls Fastpitch and the City of San Diego name Field #2 in Kyrstin's honor. Thu 4/8/10 - Clairemont High School retires Kyrstin's #16 high school jersey and places a permament sign next to 1st base in her memory. Mon 11/1/10 - It's been one year since we lost our daughter and her two friends. Clairemont Girls Fastpitch holds a candlelight vigil/memorial for Kyrstin on the anniversary of her death. Photos 363 - 435 Teammates Lost Under the Stars by Elizabeth Merrill, ESPN. Kyrstin's tribute web site. 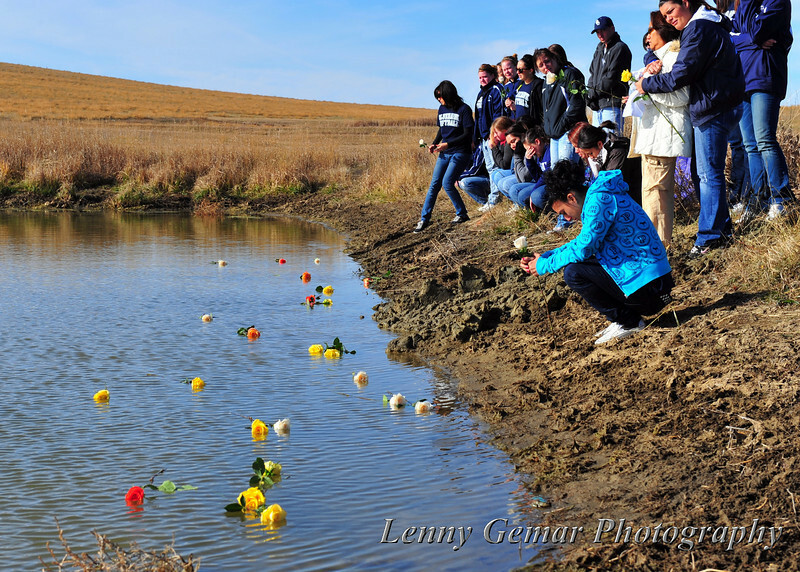 As team members gently toss roses into the pond, Nathalie Rodriguez mourns the loss of her friends.